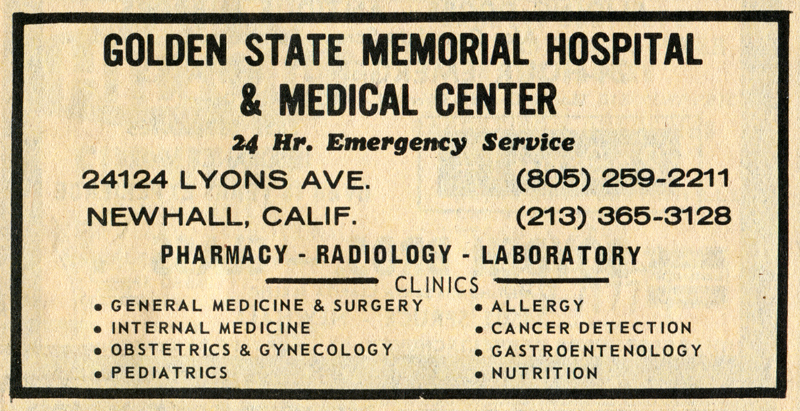 Advertisement for Golden State Memorial Hospital and Medical Center, in the 1969 Local City (Telephone) Directory for Newhall-Saugus-Valencia-Canyon Country, published by B&G Publications, Box 221, Northridge, CA 91324, in cooperation with the Newhall-Saugus-Valencia Chamber of Commerce and the Canyon County Chamber of Commerce. Established in 1962, Golden State Memorial Hospital was located at 24124 Lyons Avenue in Newhall (southwest corner of Lyons Avenue and Fourl Road, just east of Wiley Canyon Road). According to this advertisement, the facility offered the following services: Pharmacy, radiology, laboratory; and the following clinics: general medicine and surgery, internal medicine, obstetrics and gynecology, pediatrics, allergy, cancer detection, "gastroentoentenology" [sic; s/b gastroentoenterology] and nutrition. LW6901: 19200 dpi jpeg from directory page.